There are a lot of reasons that I love running and fitness. I love the way it makes me feel. I love the way it makes me look. I love the things I get to see. And I love the people I get to know. The thing I do not love, however, is the amount of negativity that some circles of the fitness community seem to thrive on, especially this time of year. With resolutions and whatnot flying around, people can get pretty competitive–and kind of mean spirited. Despite my thinking most New Year’s resolutions are bantha poodoo, I still believe that you deserve respect and support during your journey, not mockery and ridicule. We were all new to this once. You might still be new at this. It is in all of our best interests to stop mocking people for showing up to the gym or to the race and not being able to do what we, as established members of the fitness community, can do. I’m guilty of making fun of people who show up at the track or the gym in a pair of jeans instead of track pants. I’m guilty of checking other people’s treadmill speeds and making sure I set mine faster than theirs. I’m guilty of looking at someone’s squat form and snickering because they can barely even bend their knees from having too much weight on their shoulders. But you know the one thing I’ve never done? Said anything to them about it. I have never once done anything (that I know of) to inhibit anyone else’s time working out. On the other side of that, I have also never said anything to try and let help them, either. I never said anything to the fella who could barely squat that maybe his weight was too heavy, and he was likely to blow out his knees. I never mentioned to the jean-wearing power walkers that I’ve been chafed so badly by denim that I could barely walk for weeks. Maybe I should have. Not in a jerkish way, but in a “I’ve been there” kind of way. I know how hard it is to lace up my Asics instead of loading another game of Hearthstone. I know how much easier it is to lift a +5 Hammer of Awesome than an Olympic barbell. I also know how easy it is to give up. To feel no support. To feel alone and unwelcome. To feel as though my commitment and effort doesn’t count as much because I haven’t already been committed for years and years. So the next time you’re at the gym, the track, a race, or wherever, do your best to realize that the newbies who are hogging your machine or your lane are just that–newbies. They may not know the proper etiquette. They may not know proper form. They’re probably scared to death and halfway embarrassed to even be there. If you see someone working out alone (without headphones, obv), say hello. Don’t offer advice, don’t try to correct their form or compare weights. Just simply say “hi, how ya doing?” Ask if they need a spotter, or if they could spot you. Be inclusive, not exclusive. Let them know they’re a welcome part of your community. I try to do this at every race. I tend to talk to someone. Whether it’s on the course as I run by, at a water station, or after we cross the finish line, I try to strike up a conversation with a couple folks. I ask how their day’s going, if they’re having a good time, or if they look sick or like they’re struggling, ask if they need me to stick with them while they get their bearings back. It’s really about building confidence and adding new members to the community. So sure, it can be frustrating to have people take up the entire width of the track or to have people with bad form hog the squat rack, but you know what’s worse? Being given the stink-eye by the ripped guy you want to be for not being him already, being sighed at by the marathoner who passes you as you’re huffing and puffing. So just keep in mind that we’re all in this together. 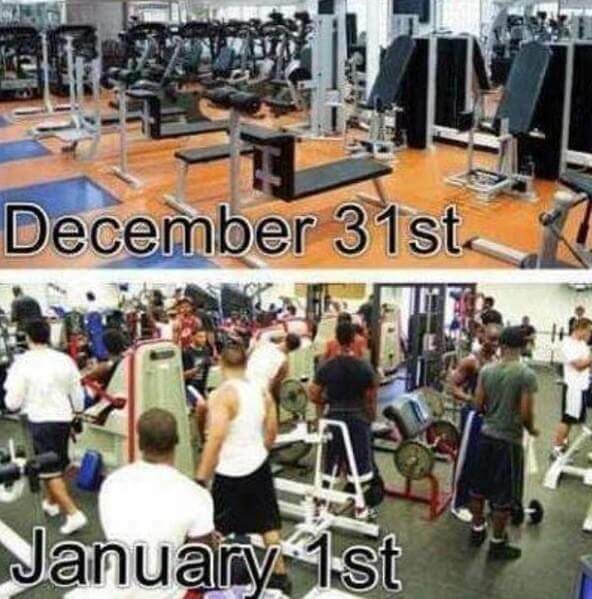 And sure, most of the people who are there at the beginning of the year won’t be there at the end of it. But it’s our place as dedicated members of the fitness community to show that it really is a #fitfam. If we treat people nicely, maybe there will be a few more members of our fitness family come December of this year. Maybe the gym won’t be so barren, and maybe you will be the reason someone stuck around. All it takes is a smile and a hello. Or maybe just not giving a newbie the stink-eye. Either way, it’s super easy and makes all the difference.